Across the wooden bridge, along the narrow path, shaded by trees, that follows a small stream, past a banda (wooden shed) selling local beer we arrive at Mwanahamisi café. The café sits on the edge of the rice paddies with a wonderful view of Mount Meru and the plantations of coffee bushes and avocadoes trees on the far side of the stream. Fresh air pours in through the open window. 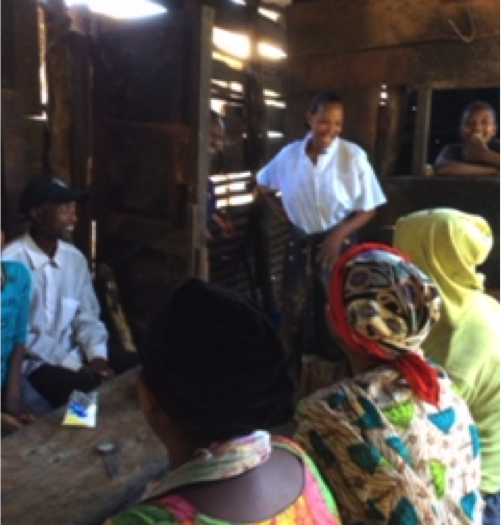 We are greeted by Mwanahamisi who runs the café with her eldest daughter, Majuma (21 years). Lunch is nearly over and a few people remain enjoying a short break chatting before they return to work. Mwanahamisi has opened her restaurant a short distance away from the small village, Chapa ya ngombe, where she lives. The village has grown up on the edges of Usa Ltd, a large estate growing coffee. The field hands/agricultural workers are hungry by mid-day and need a break from the hard work and hot sun. Mwanahamisi provides a menu of soup and fried meat cubes at lunch time. Every morning at 6am Mwanahamisi goes to the butcher where cows will have been slaughtered, enough for the daily demand. She buys offal and a cow’s head to make the soup then she walks down to the café; she is ready by 9am to prepare her soup. She boils the cow’s head in water adding salt, lemon and chilli for the soup and cuts the meat from the cheeks, chin and head to fry up in cubes to accompany the soup. Majuma and Mwanahamisi prepare a plate of food for 1,500/-. There are always a lot of hungry workers to feed from the large estate’s fields and next week the workers in the rice paddies will be weeding their crop and there will be even more demand for a mid-day meal. Business seems good. Mwanahamisi has not always been a Mama Lishe (cook). Life was different before her husband died, more than 5 years ago. After her husband’s death Mwanahamisi found herself living with HIV and with a growing family to support the twins, Loveness and Lightness aged 5, two boys at school secondary school and her eldest daughter, Majuma. Life was not at all easy and Mwanahamisi had to work as a casual labourer in the rice fields ready to start work at 7am and working in the hot sun until 5pm for a day rate of less than 5,000/- shillings. (£1.80) After a day of digging and weeding Mwanahamisi had to return home to look after the family but found herself unable to provide for their daily needs. Mwanahamisi began to attend the mothers’ support group in Usa River, set up by the Health Centre where she attends the HIV clinic. There she met James Ruby, Mondo’s community coordinator and heard about the grants programme. She first attended a training given by Mondo, which she found invaluable as it helped her to look forward and to plan for the future. She learnt how to attract customers, calculate profits and organise savings. She was given a grant of 200,000 /- in early 2016, from which she bought plates, bowls, knives and sufarias (cooking pots) and food stocks. She found herself a banda to rent and she started to make food for the agricultural workers, a few at first but her business had started. She was left with a few shillings every day to look after the family, provide food, buy them clothes, materials for school, and pay medical expenses. She is now just about to take on her first loan and with this she has plans to increase the amount of food she can provide and hopes to be able to serve 30 or 40 people a day. She also wants to upgrade her café, painting some of the interior walls and providing more comfortable seating. She has also added to her original menu by providing bananas, which she buys locally and brings to sell in her café. While her business continues to grow she is also keen to improve her living conditions and she is now saving up to build a toilet at her house. It will cost 300,000/- but every day she puts a little aside for the materials she will need to build one. This is her long term goal, something she was unable to envisage before she started receiving help and support from the Mondo programme. Mwanahamisi is pleased to be able to provide her family with good food and with a nicely decorated home of which she is very proud. If you would like to help support more women like Mwanahamisi, we are currently raising funds for our next round of grants and loans. To help us achieve our target you can donate here.